OMG! While we were walking through the Japanese Garden at MoBot, we got about 6 feet away from this gaggle of Canada geese. 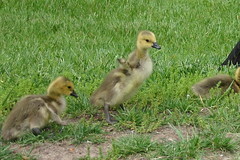 The little fuzzy goslings were just way too adorable. We snapped as many pictures as we could before they decided to wander a little further away from the path. The mother only hissed at us once. Check out this photoset on Flickr for more adorable photos of the gaggle. This entry was written by Dan, posted on May 1, 2007 at 10:58 pm, filed under Photos. Bookmark the permalink. Follow any comments here with the RSS feed for this post. Post a comment or leave a trackback: Trackback URL.